Cosmetic breast augmentation has become increasingly popular.1 In the United States, for example, cosmetic breast augmentation was the most commonly performed cosmetic surgical procedure in 2011; 307 000 surgeries were performed,2 an increase of approximately 800% compared with the early 1990s. Although breast augmentation is popular, controversies about the long term health effects of breast implants remain. The weight of evidence from epidemiological studies indicates that cosmetic breast implants are not associated with increased risk of breast cancer.3 4 5 6 7 8 9 10 11 12 13 14 15 16 17 18 19 20 21 22 23 24 25 26 Concern remains, however, that implants may impair the ability to identify breast cancer at an early stage by mammography because cosmetic breast implants are radio-opaque, impairing the visualization of breast tissue with mammography and making detection of breast cancer at an early stage more difficult.4 27 28 29 Specialized radiographic techniques have been developed for women with breast implants to improve visualization, which involve displacing the implant posteriorly against the chest wall and pulling breast tissue over and in front of the implant.29 30 31 However, one third of the breast is still not adequately visualized despite such techniques, leading to an increase in false negative mammograms.28 An estimated one in eight US women will be diagnosed as having breast cancer at some time in their lives.32 Therefore, some women with breast implants will eventually develop breast cancer, which raises concerns about the possible effects of implants on detection of breast cancer. Most studies that have evaluated the detection of breast cancer among women with cosmetic breast implants compared the stage distribution of breast cancer at diagnosis between women with and without implants. The findings from these studies have been inconsistent. For instance, some studies reported that women with breast augmentation may be more likely to be diagnosed as having advanced cancers,18 27 33 34 whereas others have reported no such difference.8 10 13 15 17 19 20 21 25 35 36 37 38 39 40 41 42 43 These conflicting results may be explained by methodological problems within studies, as well as the small number of cases of incident breast cancer in these studies which limits statistical power to obtain significant results. In addition to the question of stage of breast cancer at diagnosis, no study to date has been able to establish that women with breast implants, although they may receive a diagnosis at a more advanced stage, have a poorer survival following diagnosis of breast cancer compared with women without implants, but these studies were also impaired by relatively low statistical power.8 10 18 34 39 40 41 Better understanding of the detection of breast cancer and survival patterns following diagnosis of breast cancer among women with implants will aid in giving clear information on the consequences of breast augmentation surgery to these women and their physicians. The fact that implants may interfere with the early detection of breast cancer is particularly relevant and carries with it important clinical and public health implications. Most recent reviews that summarized the evidence of the long term effects of cosmetic breast implants concluded that they were not associated with advanced breast cancers and nor was survival affected.9 44 45 Although these papers provided a timely synthesis of the scientific literature on this question, they were not presented as systematic reviews and did not provide a quantitative meta-analysis of published studies. Through a systematic literature search, we have identified additional papers published in the past decades that were not captured by previous reviews, as well as three more recent publications,8 18 34 providing suitable data for a quantitative meta-analysis on the diagnosis and prognosis of breast cancer among augmented women. Specifically, our objectives were to verify the stage distribution of breast cancer and post-diagnosis survival among women with cosmetic breast implants compared with women without implants by means of a systematic review and two meta-analyses in accordance with the meta-analysis of observational studies in epidemiology (MOOSE) reporting guidelines.46 We also sought to identify sources of heterogeneity in risk estimates in the existing literature and to identify gaps in the current state of knowledge. This investigation is important to consolidate the existing knowledge on the long term effects of cosmetic breast implants. To identify eligible studies published before September 2012, we applied a systematic literature search strategy to the following electronic databases: Medline, Embase, Global health, CINAHL, IPAB, and PsycINFO. We also searched the Cochrane Library’s Database of Systematic Reviews. We used the following keywords and subject headings in combination to identify relevant articles in electronic databases: breast neoplasms AND (breast implants OR breast augmentation OR mammaplasty OR mammoplasty OR breast implantation OR breast prosthesis) AND (women without implants OR non augmented women) AND (delayed diagnosis OR prognosis OR survival OR delayed detection OR staging). We manually examined reference lists from retrieved articles8 10 13 15 17 18 19 20 21 25 27 34 35 36 37 38 39 40 41 42 43 47 and published reviews9 16 23 44 to identify additional manuscripts. Eligible articles were original, peer reviewed, published studies. We reviewed abstracts from identified articles to assess eligibility. Additionally, as direct contact with experts has been shown to be an effective method of retrieving relevant articles, we surveyed international experts who published papers on detection of breast cancer among women with cosmetic breast implants and associated survival rate patterns to request any relevant published or unpublished scientific articles.48 The search was limited to French and English articles. Eligible publications (that is, case-control studies, cohort studies, or cross sectional studies) were those that included women diagnosed as having breast cancer and who had had antecedent augmentation mammaplasty for cosmetic purposes. The comparison group consisted of women diagnosed as having breast cancer who had had other common elective cosmetic surgeries or who were from the general female population. Eligible publications for the evaluation of the association of breast implants with the stage distribution of breast cancer had to include the number of women with breast implants diagnosed as having breast cancer (exposed group) and women without implants diagnosed as having breast cancer (unexposed group) per stage of breast cancer at diagnosis or per status of nodal involvement, metastases, or both. We used measures of association describing the odds of having non-localized breast tumors (nodal involvement positivity, metastases to distant sites, or both) comparing the exposed breast cancer cases with the unexposed cases if they were provided in the paper. Otherwise, we calculated the crude odds ratios, their respective standard errors, and 95% confidence intervals from the contingency tables. When several publications were available for the same study group, we retained the most recent one for analysis. We excluded publications without a comparison group for the women with implants. We also excluded those that did not provide measures of association and did not provide crude numbers in contingency tables allowing calculation of measures of association regarding stage of breast cancer at diagnosis. A certified librarian did the search, and two authors (EL and SYP) independently excluded studies at the first stage of evaluation for eligibility. The two authors discussed studies identified for a more detailed assessment on the basis of the abstract and title. Two authors (EL and SYP) independently extracted characteristics of studies and resolved any uncertainty through discussion. The characteristics extracted were source of data on implant, source of data on breast cancer diagnosis, source of data on mortality, assessment of stage of breast cancer, nodal involvement, type of comparison group, number of women with implants with breast cancer, number of women without implants with breast cancer, mean length of follow-up, average age at diagnosis of breast cancer, whether statistical adjustment for potential confounders was done (for example, adjusting for age at diagnosis, period of diagnosis) and results (cell counts, odds ratios, hazard ratios, and 95% confidence intervals). Adjusted estimates were always selected over unadjusted estimates when provided in the paper. We created a dichotomous variable for the exposure variable (presence of breast implants with breast cancer versus no implants with breast cancer) and for the outcome (stage distribution of breast cancer). Staging of breast cancer among the studies included principally the American Joint Committee on Cancer’s tumor node metastasis (TNM) classification,52 53 without limiting the edition of the classification that was used, and the US National Cancer Institute’s surveillance epidemiology and end results (SEER) summary stage system.54 For the purpose of consistency in the analyses, we excluded, when possible, ductal carcinoma in situ, lobular carcinoma in situ, and all other non-invasive breast cancers. We did this because several publications included in our meta-analyses excluded these cases on the basis of problems with data quality related to the reporting of in situ cancers. Therefore, we considered only invasive breast cancers. Given the considerable variability across studies for the classification used for stage distribution of breast cancer, especially between the TNM classification and the SEER summary stage system, we dichotomized the response variable as non-localized breast cancer (regional or distant) versus localized breast cancer. We firstly chose this cut-off for clinical relevancy because localized breast tumors are potentially more curable than non-localized tumors and are associated with better survival rates.55 Additionally, we chose this cut-off for purposes of compatibility between the two cancer staging systems. Irrespective of the classification system, breast tumors that did not spread to regional lymph nodes or distant sites were considered to be localized tumors. Therefore, non-localized breast tumors were considered to be advanced or later stage breast cancers. We also did sensitivity analyses to identify studies contributing disproportionately to the observed heterogeneity. We did this by omitting each study one by one to analyze the influence of individual studies on the summary estimate,60 and also by comparing the studies for which in situ breast cancers could not be excluded with those studies for which we excluded in situ breast cancers. We also made a visual inspection by using the Galbraith plot to detect possible outlier studies that have an excessive influence on the overall estimate.61 62 To identify potential sources of heterogeneity, we examined only the association between cosmetic breast implants and stage distribution of breast cancer, as we had too few studies to examine sources of heterogeneity for the association between cosmetic breast implants and survival. We did this by calculating a summary odds ratio across strata of factors selected a priori as potentially related to quality of study and that were present enough across studies to allow stratification. These factors included source of comparison group (other cosmetic surgery controls versus population based controls), source of exposure data (plastic surgeons’ records versus medical records), breast cancer staging system (TNM staging versus SEER staging), and statistical adjustment of the odds ratio for potential confounders (adjusted versus unadjusted). We also evaluated the effect of these factors on heterogeneity by using random effects meta-regression models. This investigates how a categorical or continuous characteristic at the study level is associated with the effect estimate in the meta-analysis.60 The outcome variable in the meta-regression models in this study is the odds ratio and the explanatory variables, also called potential effect modifiers, are the factors selected a priori as potentially related to study quality. We also evaluated the year of publication of each study as a potential source of heterogeneity as a continuous variable in a meta-regression model. We assessed publication bias for the association between cosmetic breast implants and stage distribution of breast cancer by using a funnel plot and Egger’s test.63 We did not have enough studies to examine heterogeneity and publication bias for the association between cosmetic breast implants and survival. Twelve studies, all cross sectional in their design, provided sufficient data to be included in a meta-analysis to evaluate the association between cosmetic breast implants and stage distribution of breast cancer. Table 1⇓ shows characteristics of the 12 studies meeting the inclusion criteria and selected for the quantitative analysis. Most of these were published after 2000 and were conducted in the United States. The remainder were conducted in northern Europe or Canada. The other 10 papers were all excluded because they overlapped with more recent publications with an extended follow-up of the same study group. 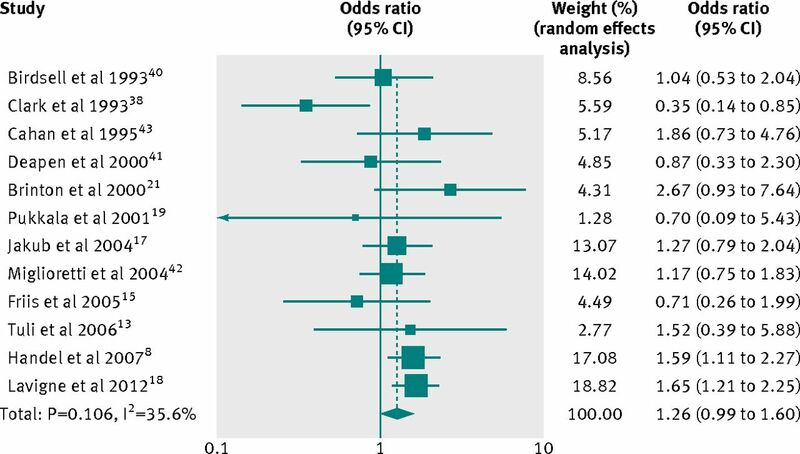 Figure 2⇓ shows the results of the meta-analysis. The size of each box indicates the relative weight of each publication in the meta-analysis, and the bars show the 95% confidence intervals. Based on the 12 studies, the summary odds ratio with the random effects model was 1.26 (95% confidence interval 0.99 to 1.60; P=0.058) for a non-localized stage of breast cancer at diagnosis comparing women with breast cancer who had implants with women with breast cancer who did not have implants. Moderate heterogeneity was present (Q=17.07, P= 0.11, I2=35.6%). Sensitivity analyses showed that one publication, Clark et al,38 accounted for all the observed heterogeneity. When we included all 12 studies in the analysis, I2 was 35.6 %. I2 was 0% when this paper was removed, suggesting that it had an important influence on the overall estimate.60 Additionally, the Galbraith plot showed that this study contributed disproportionately to the observed heterogeneity (data not shown). The summary odds ratio using the random effects model when that study was excluded was 1.42 (1.19 to 1.68). The omission of all other studies separately resulted in random variation around the overall estimate for the remaining 11 studies. Moreover, sensitivity analyses showed that the omission of five studies for which in situ breast cancers could not be excluded resulted in an overall estimate similar to the one mentioned above (odds ratio 1.40, 1.10 to 1.78).8 17 38 40 43 The Egger’s test did not indicate the presence of publication bias (P=0.16). Additionally, a visual inspection of the funnel plot did not suggest publication bias as the studies were distributed symmetrically about the combined effect size (data not shown). Table 2⇓ shows results with stratification by variables potentially related to quality of study. Overall odds ratios stratified by these variables did not produce meaningful differences, except for the studies that provided adjusted estimates for relevant covariates such as age at diagnosis of breast cancer and calendar period of diagnosis (odds ratio 1.51, 1.18 to 1.92). In comparison, studies that did not provide adjusted estimates yielded an overall odds ratio of 1.07 (0.74 to 1.55). In addition, the summary effect for the three studies that compared women with cosmetic breast implants with women who received other elective cosmetic surgery was 1.53 (0.89 to 2.64) and the odds ratio when comparing women with implants and the general female population was 1.16 (0.88 to 1.53). Table 2⇓ also shows the statistical significance of meta-regression models. Inclusion of these variables one at a time in a random effects meta-regression model did not reach statistical significance. Table 3⇓ shows a description of the five publications, all with a cohort design, included in the meta-analysis for the association between cosmetic breast implants and breast cancer specific survival following diagnosis of breast cancer. The two papers that were excluded overlapped with a more recent publication. Figure 3⇓ shows the results of the meta-analysis of cosmetic breast implants and breast cancer specific survival. The overall hazard ratio comparing the breast cancer specific mortality after diagnosis between women with breast cancer who had implants and women with breast cancer who did not have implants was 1.38 (1.08 to 1.75), with no heterogeneity observed (Q=3.35, P=0.50, I2=0.0 %). The Egger’s test did not indicate the presence of publication bias (P=0.84). Omission of the publication that assessed overall mortality resulted in random variation around the overall estimate of the four remaining studies. We did not have enough studies to do a meta-regression. This systematic review suggests that women with cosmetic breast implants have later stage tumors at diagnosis of breast cancer. In our second meta-analysis, the results show a higher risk of breast cancer specific mortality among women with breast cancer who have implants compared with women with breast cancer without implants. Nevertheless, the overall estimate should still be interpreted with caution because this meta-analysis included a relatively small number of studies. Of concern, three of five studies had unadjusted hazard ratios (not adjusted for age at diagnosis, or period of diagnosis) and all five studies were unadjusted for other potential confounding factors such as body mass index, which could translate into a biased estimate of the summary hazard ratio. A lack of adjustment for body mass index has previously been shown to lead to underestimation of the association between cosmetic breast implants and breast cancer mortality.18 Moreover, one study included in this meta-analysis assessed overall mortality rather than breast cancer specific mortality,39 which could have biased our summary estimate towards the null. The small number of studies and insufficient amount of follow-up time in these studies are suspected to limit statistical power to clearly evaluate survival rate patterns among augmented women. Given the limited evidence, no conclusion regarding breast cancer specific survival can be drawn and continued follow-up to further evaluate this question is particularly relevant. The finding of later stage tumors at diagnosis of breast cancer in women with implants can be explained by multiple mechanisms, the first being that both silicone and saline implants create radio-opaque shadows on mammograms, which impair the visualization of breast tissue.65 The amount of parenchymal breast tissue obscured at mammography by the implant is known to be between 22% and 83%.66 Insufficient compression of the breast to visualize the parenchyma and the production of implant related artifacts on the film can also make interpretation of mammographic examinations difficult in women with augmented breasts.28 29 Additionally, capsular contracture, which develops in about 15-20% of women with implants, has been shown to reduce mammographic sensitivity by 30-50%.65 Furthermore, specific characteristics of breast implants might affect the detection of breast cancer.67 Specifically, implants placed under the breast glands (subglandular placement), because of their proximity with breast tissue, are suspected to obstruct mammographic visualization of the breast more than those with submuscular placement.4 33 However, to date, only one study has been able to evaluate the stage distribution of breast cancer according to implant placement.18 34 Results from this study were inconclusive. Despite the fact that implant displacement techniques are widely used with mammography, studies suggest that breast tissue is still not adequately visualized.8 65 Recent reports suggest that magnetic resonance imaging of the breast may be a helpful diagnostic tool for women with breast implants; it allows examination of all breast tissue surrounding the implant,68 69 and so has greater sensitivity than mammography.70 However, insufficient evidence exists to support the use of magnetic resonance imaging in the diagnosis and prognosis of breast cancer, which warrants further research. Stratification and meta-regression models showed that no potential factors seem to unduly affect the results of the study. When we calculated a summary effect for the three studies that used women who had received other elective cosmetic surgery (chemical peel or dermabrasion, coronal brow lift, otoplasty, rhinoplasty, rhytidectomy, or blepharoplasty) as the comparison group, we observed a stronger association than the one obtained when the general female population was used as the comparison group. Women with other cosmetic surgery are recognized in the scientific literature as being a more appropriate comparison group when studying the health effects associated with cosmetic breast implants, because they tend to be more similar in terms of sociodemographic and lifestyle factors as well as health consciousness than are women in the general population.71 72 A previous study conducted in the United States showed no significant differences with respect to family income between women with cosmetic breast implants and women with other cosmetic surgery, which supports the notion that both groups are of similar socioeconomic status.71 For example, women seeking cosmetic surgeries could have better screening and self examination practices than women in the general female population, which would translate into higher chances of a breast tumor being diagnosed after screening mammography if one is present. This suggests that using other women with cosmetic surgery would be more adequate in terms of controlling for potential confounders. Moreover, studies with adjustment for confounding factors such as the age of breast cancer at diagnosis yielded statistically significant effects that were stronger than those without adjustment. One study showed that a lack of adjustment for the age at which breast cancer was diagnosed underestimates the measure of association.34 This outlines the importance of providing adjusted estimates. In meta-regression models, we were not able to detect the modifying effect of the type of comparison group and the adjustment for cofactors, but a lack of statistical power due to the small number of studies may explain why the above differences in odds ratios are not statistically significant. Our study has several limitations specific to our analysis and to the different methods used across studies. For instance, certain studies used in both meta-analyses included cases of in situ breast cancer because we were not able to exclude them on the basis of the limited information available in the papers.8 17 38 40 43 This could have resulted in a non-differential misclassification bias of the outcome variable. One study, by Clark et al,38 was responsible for all observed heterogeneity in the analysis of stage distribution of breast cancer at diagnosis. We believe that the results of this publication may be affected by a selection bias, which is supported by the quality assessment scale (supplemental file in web appendix). Moreover, a previous publication also raised the concern that the results of the study by Clark et al may have been influenced by a selection bias.39 Pooling results from several observational studies has the advantage of increasing statistical power but does not increase internal validity. Misclassification bias, selection bias, and assessment of confounding affecting individual studies will also affect the meta-analyses. Misclassification biases within each study could also be a factor affecting study specific measures of association and consequently our pooled effect. For example, the identification of deaths from breast cancer could be affected by data quality problems such as a misclassification of the cause of death. This could result in biased estimates of breast cancer specific survival, resulting in an underestimation of our pooled effect. Although we have evaluated the quality of the studies with an assessment scale,64 no threshold scores were available to distinguish between “good” and “poor” quality studies, which could limit our results as we may have included studies of poorer quality in our analyses. Another limitation of our study could be related to the methods used to pool the hazard ratios from available data in each study, which may have underestimated the variance of the estimates. Our results should be interpreted with caution, considering the current gaps and limitations in the available literature. The accumulating evidence suggests that women with cosmetic breast implants who develop breast cancer have an increased risk of being diagnosed as having non-localized breast tumors more frequently than do women with breast cancer who do not have implants. Moreover, current evidence also suggests that cosmetic breast implants adversely affect breast cancer specific survival following the diagnosis of such disease. Further investigations are warranted into the long term effects of cosmetic breast implants on the detection and prognosis of breast cancer, adjusting for potential confounders. We thank Melanie Weger, reference librarian at Health Canada, for doing the search of the scientific literature and Anne Rosenberg for sharing data on a previous publication. Contributors: EL, JB, and EJH were responsible for study concept and design and supervised the study. EL and SYP acquired the data, which was analyzed and interpreted by EL, JB, EJH, SYP, PJV, KCJ, DAF, and HM. EL drafted the manuscript, which was critically revised for important intellectual content by EL, JB, EJH, SYP, PJV, KCJ, DAF, and HM. EL did the statistical analysis with supervision from JB, EJH, and DAF. EL is the guarantor. Funding: This work was supported through scholarship grants by the Unité de Recherche en Santé des Populations, Cancer Care Ontario, and the Public Health Agency of Canada. Competing interests: All authors have completed the ICMJE uniform disclosure form at www.icmje.org/coi_disclosure.pdf (available on request from the corresponding author) and declare: no support from any organization for the submitted work; no financial relationships with any organization that might have an interest in the submitted work in the previous three years; no other relationships or activities that could appear to have influenced the submitted work. Meunier A, Tristant H, Sinna R, Delay E. [Mammary implants and breast cancer] [French]. Ann Chir Plast Esthet2005;50:595-604.